In this age of energy and climate change crises, solar energy has become an increasing attractive alternate to fossil fuel based energy. In particular, photovoltaic devices made from conducting polymers show great promise as a new technology for renewable energy. One major problem with these devices is that the polymer only absorbs sunlight of wavelength 550nm and less. At Newcastle we have shown that absorption of light by porphyrins incorporated into photovoltaic devices, in which the active layer is a conducting polymer (MEH-PPV) and fullerene (PCBM) blend, contributes to the total photocurrent generated by the device. One way to increase the efficiency of these devices is to further extend the region of the solar spectrum in which the active layer absorbs light. 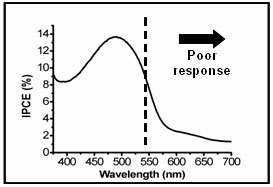 Typical porphyrins such as H2TPP have absorptions which extend out to around 645nm. However, N-confused porphyrins (porphyrins in which one or more of the pyrrolic nitrogens are orientated to the outside of the core) have absorptions which extend beyond this, out to 724nm for H2NCTPP and potentially much beyond this. Morphology of the materials within these devices is critical to device function. In order for the devices to work efficiently we need to minimise interactions, and thus aggregation, between the porphyrins in the device. We have shown that this can be achieved by preparing more sterically bulky porphyrins and N-confused porphyrins. Having shown that these materials can be effectively incorporated into organic solar cells we are now engaged in ongoing research to design and synthesise porphyrinic materials which increase the efficiency of these devices. Field effect transistors (FETs) are essential electronic devices which act as switches and signal amplification components in all sorts of electronic devices. A typical FET is constructed with the following basic components as shown: electrodes (i.e., gate, drain, and source electrodes), a dielectric layer, and a semiconducting channel. The current flow between the drain and source electrodes (IDS) is controlled by the applied gate voltage (VG). 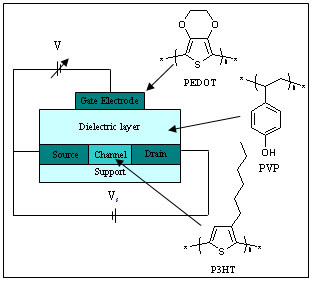 Recently a new, more effective FET has been proposed in which the dielectric layer is composed of polyvinylphenol (PVP). PVP is a 'wet' polymer containing a network of hydrogen-bonded water. These 'hygroscopic insulator' FETs are believed to operate via the movement of protons through the water matrix within the dielectric layer, this allows the HIFETs to work at much lower voltages than typical commercial FETs. Work is currently underway in conjunction with A/Prof Paul Dastoor to combine these devices with enzymes to create novel biosensors. An interesting way of improving these devices would be to use polyvinylpyridine (PVPy) as the dielectric material. Like PVP, PVPy is a hygroscopic polymer. However, the pyridyl group is basic and so the proton content of the dielectric layer, and thus the properties of the device, can be modulated by controlling the protonation of the pyridyl groups. Further control can be achieved by varying the anionic counter ion to the protons. This project will investigate the use of PVPy as a dielectric material in combination with a variety of acids and conjugate bases to establish operational boundaries for PVPy-based HIFETs.